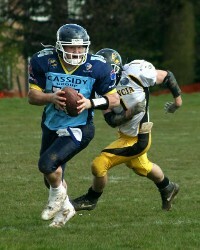 2008 American Football National Champions the Cassidy Jets have begun the arduous task of appointing the successor to Gerry McManus. As the only Head Coach in the club's five year history, McManus compiled an impressive record of ?-? including 3 bowl victories and 2 straight European campaigns. September's 33-32 victory over the London Blitz at the Keepmoat Stadium in Britbowl XXII marked the end of a remarkable journey that began with an 0-8 season in 2004. “I've often been asked about the bad times at the Jets” remarked McManus, “but to be honest there haven't been any. Even at 0-8 I always felt that we were moving in the right direction. Jamie Kilby, who deserves all the credit for bringing American Football back to Coventry, had a vision that we all bought into and with Pete Evans on-board as well, everything began to fall into place”. Quite apart from the recruitment of backroom staff, McManus cites the signing of Mark 'Bird' Cohen as amongst the most significant. “Enticining 'Bird' out of retirement was the catalyst to us signing some great players such as Steve Coles & Tony Perkins for the 2005 season. Paul Newey, one of the best linebackers to play in the UK, was already at the club and acted like a magnet drawing in even more high profile players over the years”. As the high points, McManus seemed spoilt for choice “there were so many where do I start? Britbowl XXII, what a great advert for our sport, I was so proud of the team. I asked them to dig deep at half time to show the spirit that had seen us win in Oslo and run the Raiders so close. To a man they responded, Jeremy Simms’ 4th down reception was amazing and seems to get overlooked but that’s what put us position for a chance to win the game and Fraser stepped up and nailed it”. “Winning our group in Eurobowl was very satisfying as everyone had written us off and I honestly believe that if we’d travel to Austria with a full-strength team we’d have run them even closer. Stepping out at the Ricoh Arena was also a momentous occasion and a great game to boot. I leave the best team in football with no regrets and know that it’s in good hands. It’s time now to turn my attention to my family so it just remains for me to thank my wife Moira for her patience and understanding over the past 5 years”. Club Secretary Adam Etheridge thanked McManus for his service and turned attentions to finding his successor. “We’d like to invite potential candidates to apply for the position of Jets Head Coach. Following Gerry will be a mammoth undertaking but the calibre of Coaches that have expressed an interest is very high. Anyone interested such submit their Coaching CV through the clubs website www.cassidyjets.com”.